Georgia's Cat Corner at Georgia's Gifts is a website with cat themed gifts, home & garden decor, and fashion accessories for cat lovers. Featuring Whimsiclay Cats and Laurel Burch Cat Handbags & Scarves, we also offer a large selection of kitchen decor. Other items include plush cats, ceramic and miniature porcelain cat figurines, tshirts, and various cat themed home & garden decor. We continue to search for whimsical and functional gifts to add to our selection so our customers will always find something new & fun when shopping our site. Of course we want to tell you about our cat! 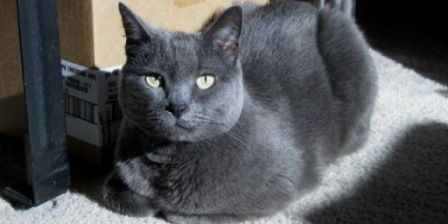 We currently own one cat, Dessa, who is a beautiful Russian Blue. We had adopted 2 sweet fur-babies from a shelter and raised them from tiny kittens. 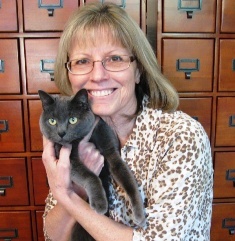 Sadly, we lost our yellow tabby, Sammi, but she is forever in our hearts. Enjoy visiting and shopping our site. We are always open to comments & requests so don't hesitate to call or email us.